Highland Custom Homes are custom home builders in Utah. They make the process of building a house a breeze. Below are the steps to building with Highland. STEP 1 – IDENTIFY THE LOT. Some people might already have the lot while others might need a little help identifying finding a lot. 8/10 People usually have a lot purchased and want Highland Custom Homes in Utah to build on it. The remainder of our clients don’t have a lot. If this is the case we can work together to finding the perfect lot for your future dream home. STEP 2 – START THE ARCHITECTURAL PLANS. Building a custom home can be a daunting process. Highland Custom Homes makes it simple. If you don’t have an architect in mind, the experts at Highland can help you choose your architectural soulmate. STEP 3 – SECURE LENDING/FINANCE. The client has to secure a construction loan. About 50% of our clients have already started the process of securing a construction loan before they come to us. They work closely with many financial institutions and can help you decide which one will best serve you and your specific situation. STEP 4 – CITY PLAN SUBMISSION. After the client approves the designs the architect will send them to Highland. Then, Highland sends all part os the design to the separate contractors to get estimates. Once they receive the estimates from the contractors they go back to the client to present final bid. STEP 5 – GETTING A BID FROM HIGHLAND. Once the client accepts the building estimate Highland puts the homeowner under contract. At that point, Highland Custom Homes submits the home design plans to the city. After the city accepts the plans, usually 2-3 weeks, Highland, the custom home construction company, puts the shovel to the dirt and the hammer to the nail to begin building your dream home. 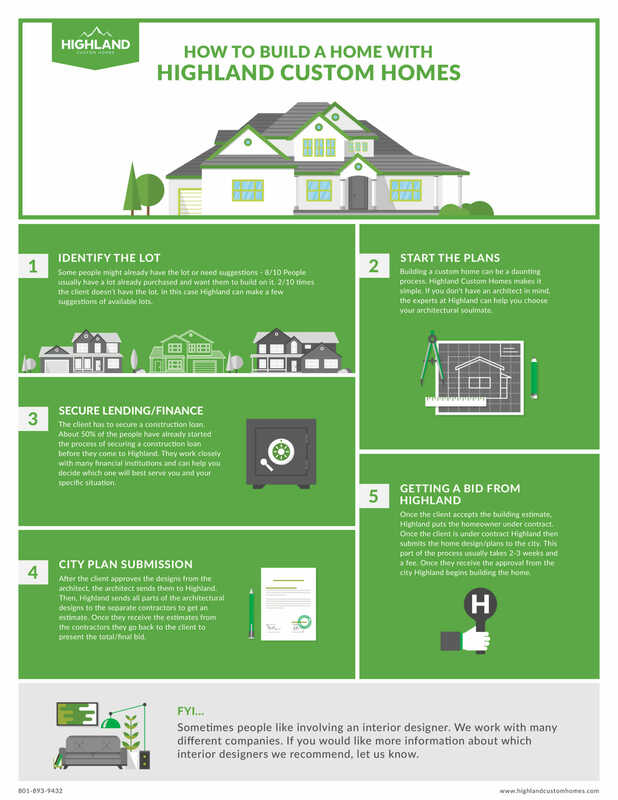 Contact us today to start this process for your own home. If you would like to see some examples of our work, please feel free to stop by our 2018 entry in the Utah Valley Parade of Homes.